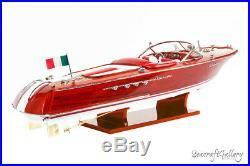 Capture classic European luxury with our exquisitely handcrafted Riva Aquarama speedboat model. Riva is an object of desire and an expression of dreams. Always innovating, always ahead of its time, always exhibiting a style and quality beyond comparison, Riva triumphs at all the boat shows and on all the markets in the world. 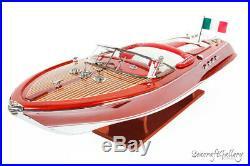 You can own the Riva Aquariva’s charm and sophistication today with our incredibly realistic Riva Aquarama model speedboat. 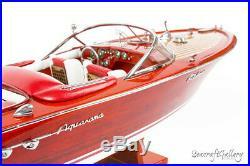 Highlights about the wooden Riva Aquarama boat model. Dimensions of the model are L65 x W19 x H20 cm. Plank on frame construction where each strip of wood is applied to the hull one at a time. Highly polished smooth finish. Many layers of paint and varnish applied. Each layer is left to dry and micro sanded before another layer is applied. Brass & stainless steel fittings no plastic parts. 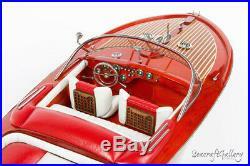 Amazing Details accurate to actual Riva Aquarama speed boats. 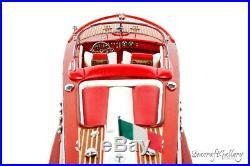 Metal propellers, steering wheel, horns and Italian flag. Realistic gauges and switches on dash are not a sticker or decal. Meticulously painted to match real Riva Aquarama. Sturdy wooden base attached. 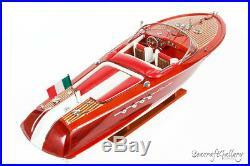 The Riva Aquarama was a speedboat model built by Riva. Production ran for over three decades from Aquarama’s introduction in 1962 till 1996. Carlo Riva launched the Aquarama runabout series in 1962. Aquarama’s hull was based on Riva Tritone – an earlier model speedboat by Riva. Because of the boats speed, beauty and craftmanship behind it Aquarama was praised as the Ferrari of the boat world. The company was founded by Pietro Riva in 1842. The Riva Aquarama’s 10.5 metre hull was carved from mahogany wood. Hull was varnished so it left the wood visible. All versions of the Aquarama were twin engined. Power varied from 185 hp to 350 hp per engine. For example Cadillac- and Chrysler-engines tuned by Riva where used. Aquarama’s cruise speed was up to 45 knots. On top of the engine compartment there was a cushioned sundeck. Boat also carried a convertible roof which disappeared behind the rear seat and cockpit. There was a swim ladder mounted in the stern of the boat. Seacraft Gallery brings you the highest-quality model ships found anywhere. We know how important it is to you that your model arrives in perfect condition. You can order with confidence that when you receive your model, you will love it! The hull, front and back of the model rests in styrofoam and it is placed inside of a heavy duty carton box. “This Side Up” and “Fragile” stickers are always attached to the box to ensure that it is handled properly. Check anytime to see exactly when your model is expected to arrive. If you sign for the goods in’Good Condition’ you will not be able to process a claim. You Might Also Like. HM Bark Endeavour 75cm. Australia II Yacht 40cm. 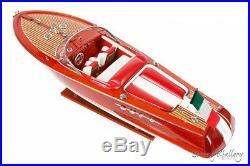 The item “HANDCRAFTED WOODEN MODEL SPEED BOAT SHIP RIVA AQUARAMA GIFT DECORATION(70cm)” is in sale since Tuesday, April 18, 2017. 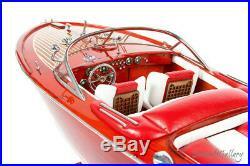 This item is in the category “Collectables\Transportation\Nautical”. The seller is “seacraftgallery” and is located in Yagoona. This item can be shipped worldwide.